The following is a questionnaire that is used for this chapter. 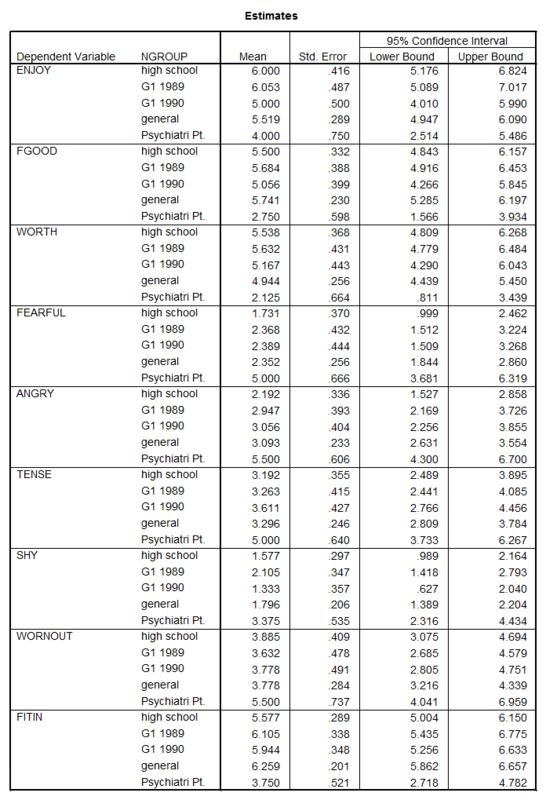 It includes the names of the variables SPSS programs. 1. enjoyed your leisure hours (evenings, weekends, etc.)? 2. felt good about yourself or things you have done? 3. felt like you've spent a worthwhile day? 4. felt fearful or afraid? 11. done what you should? 12. finished things you started? 14. felt sad or depressed? 15. felt mixed up or confused? 16. felt bored or useless? 17. felt like hurting yourself? 18. had a say in what you did? 21. done something just for fun? 28. sorry for things done? 30. forced to do things? 037 did you handle the basic necessities such as paying bills, shopping and taking care of your room (home;apt)? 43. good with your hands? 44. different from other people? 45. good at solving problems? 54. like to be touched? 58. plan for the future? 60. like your work (studies)? 62. tell people what to do? 63. do what you say you will? 65. have a "sixth sense?" 66. show people how to do things? 67. get into trouble with the law? 68. help people resolve conflicts? 69. feel good about your body (appearance)? 70. do things better than most people? 71. have purpose in your life? 72. arrange things to help people get things done? 73. like to be included in activities? 74. stand up for what is right? 75. express your negative emotions? 76. express your positive emotions? 78. care what other people think of your behavior? 79. I feel that I do a good job (as self‑employed,housewife student, or employee)? 80. Emotional problems interfere with my work (or studies)? 81. I get things by being gentle rather than demanding? 82. In the past month,the amount of money I had, was enough to pay the bills? 83. In a group of people I can get them to do things. 84. I follow my own ideas rather than other peoples. 85. I sometimes think death might be the solution to my problems. 86. I do things on the spur of the moment. 87. What happens in my life is up to me. 88. People should be paid at a rate that they produce goods. 89. Someone who breaks the law should be punished. 90. The "down and out" person can count on me to help out. 91. I have been unable to quit doing something that I wanted to quit (like eating so much, or smoking). 92. My life is exciting. LIKEME94. People are out for themselves. WHEN SOMEONE DISAGREES WITH YOU, WHAT DO YOU DO? 95. try to understand their position. 96. stand firm on your point. 97. go along with them. 98. don't express your opinion. 100. get the disagreement resolved. 103. feel close to spouse. 104. get support from spouse. 105. share in productive activity with spouse. 106. share in leisure activity with spouse. 109. feel close to family. 110. get support from family. 111. share in productive activity with family. 112. share in leisure activity with family. 115. feel close to friends. 116. get support from friends. 117. share in productive activity with friends. 118. share in leisure activity with friends. 121. feel close to co‑workers. 222. get support from co‑workers. 123. share in productive activity with co‑workers. 124. share in leisure activity with co‑workers. The following are the labels for NGROUP. What does it mean that the MANOVA is significant? 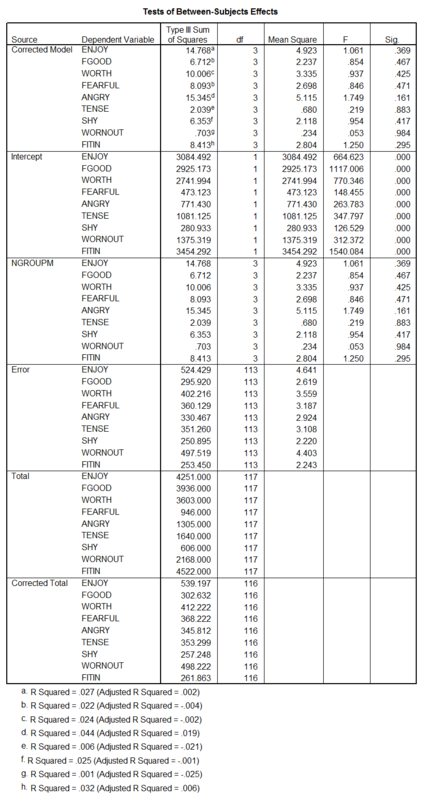 All of the y variables are combined into a single dimension very much like a factor in factor analysis, so that each has a weight (like a beta weight) and are then combined to form a single variable. The score is like our old Y' (Y primed) formula. So that, in fact, an ANOVA is computed using this new Y' and the Y variables. Consequently, the significant MANOVA indicates that there is a difference between at least two of the groups when comparing the means on this new Y variable that is due to chance at less than .0001 level of probability. Consequently, there is a lot that it does not indicate: it does not indicate which two groups might be different, nor does it indicate which of the combined variables might be producing that effect. It is therefore necessary to determine which variables are producing the effect and which groups are producing the effect. It may be useful at this point to identify the advantages and disadvantages of using MANOVA. 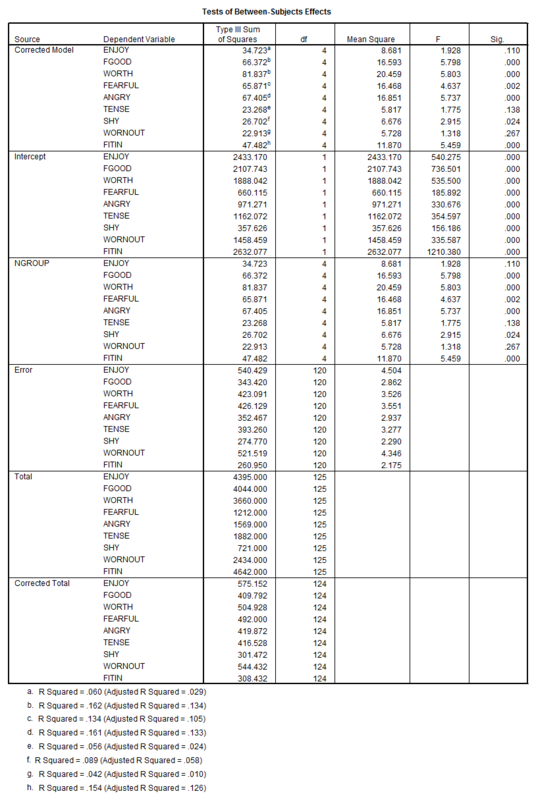 The advantages are: (1) it gives you an overall indication of the effect of multiple y variables (dependent variables) that you could not get using ANOVA, for example, (2) it guards against Type I errors in that it gives an estimate for all of the variables at once (if many ANOVAs were computed each one individually gives a biased estimate depending on the number computed), and (3) under certain conditions it may reveal differences not shown in separate ANOVAs. The disadvantages are: (1) the ambiguity of interpretation, (2) the situations where MANOVA is more powerful is quite limited, most often is it less powerful, (3) ] must eventually be computed to assess the meaning of the result and further pairwise comparisons must eventually be computed to assess which groups produce the effects. My recommendation is to use MANOVA with caution. In order to show the effects the MANOVA will be computed again without one of the groups. The only changes between this jobstreat and the previous os (lsqman6a.sps) is that this jobstream does not include the group os psychaitric patients. alpha = .122. The .009 alpha becomes .111. 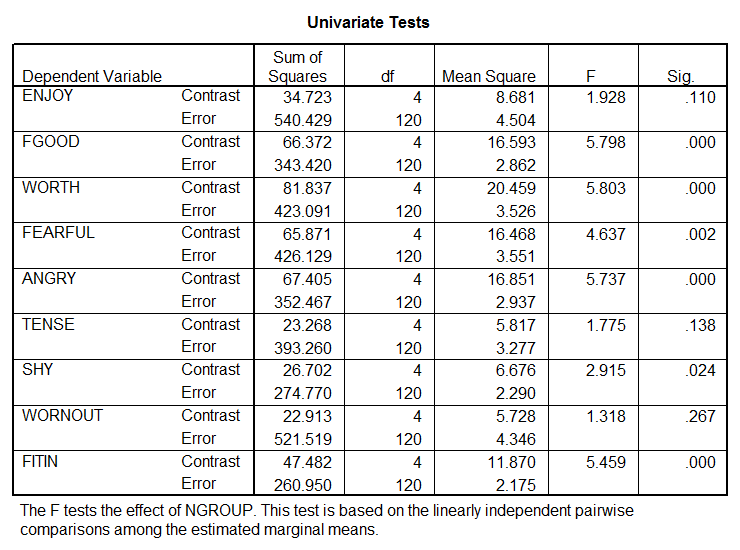 Note that the MANOVA is significant as well as the two univariate tests. 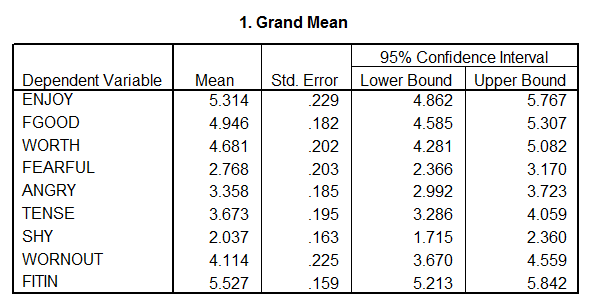 When a number of DVs are significant it is necessary to perform a "step‑down" analysis in order to determine whether a single variable may account for the significance in very much the same way that in multiple regression it is necessary to determine if there is a single variable that accounts for all of the variance in y. The method of doing this is compute a number of DVs identifying the theoretically most important variable or the empirically highest loading variable as the DV and all other y variables as covariates. 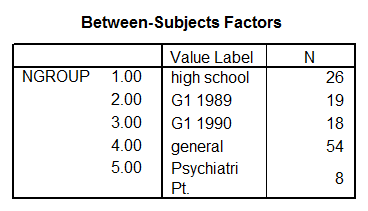 Any variable, when identified as the DV when the ANCOVA remains significant is considered a significant variable. The next job stream treats the most empirically strong variable as the DV and the weakest variable as a covariate in an ANCOVA analysis. 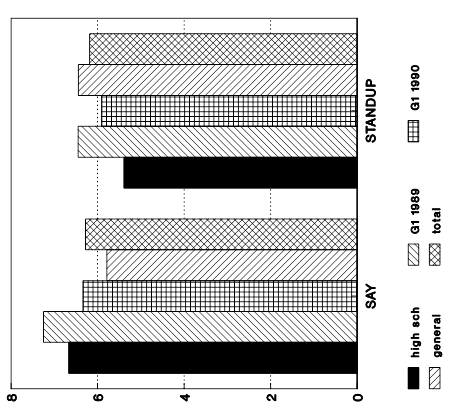 Notice that the alpha is significant at the .006 level indicating that SAY is significant when variance for STANDUP is taken out removed. This is the same procedure that is used when the variance of one variable is removed from the multiple regression formula and the remaining variable is tested for significance. Next STANDUP is tested when SAY is removed.